These replacement power window regulators are just what you need to get your vehicle in good shape again! These power window regulators make great replacements and have good cost savings over dealer units. This repair is easier than you may think. You'll find our installation videos helpful. In our experience removing and replacing the door panel is the most involved step in the repair. On most vehicles this only requires removing a few screws and push-in clips. You'll get a great feeling of accomplishment after you complete this repair knowing you saved money, and you didn't have to give up your car for a day at the repair shop. Your passengers and other drivers will be amazed. 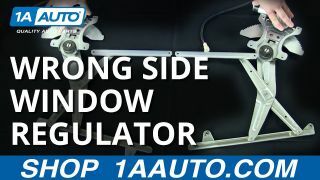 1A Auto will refund you with no hassle if this window regulator does not fit the application stated. This regulator will install just as your original does. Save time and money. Be confident this part will work right. Every regulator is tested after assembly to make sure all mechanisms are working correctly.